NanoCore12 can sense its environment through various sensors and can affect its environment by controlling various devices: lights, motors, sound transducers, and various actuators. The microcontroller on NanoCore12 can be programmed with Assembler, BASIC, C, or Forth. NanoCore12 projects can be autonomous or they can communicate with software running on a computer (e.g. Adobe Flash, VisualBASIC, C#, etc.). 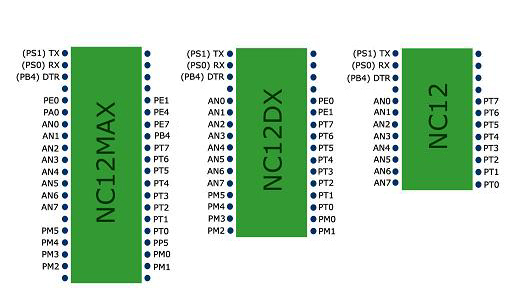 Besides on-board RS232 transceiver, voltage regulator, crystal and PLL support circuitry, all NanoCore12 modules sport a MC9S12C MCU, loaded with up to 128K Flash, up to 4K RAM, and a rich assortment of advanced on-chip hardware peripherals. Not only is it blazingly fast (24MHz bus) and powerful, but it is a breeze to multi-task for such demanding apps as robotics and real-time control. A free Special Edition of the industry standard CodeWarrior Studio for Windows is available from Freescale, and supports up to 32K of C source code, and unlimited assembler. See Resources for details. For educational and hobbyist (i.e. non-commercial) applications, the free SBASIC compiler by Karl Lunt is a good choice. While it is a DOS cross-compiler, it is easily used from Windows. Also from Karl Lunt is the free Tiny4th compiler. See Resources for details and URLs. ®BASIC Stamp is a registered trademark of Parallax, Inc.
7. Serial Peripheral Interface*(SPI) for easy interface to LCDs, SD cards, MP3 chips, DACs, clock/calendar chips, serial EEPROM, etc. * SPI is not present on 24-pin versions.